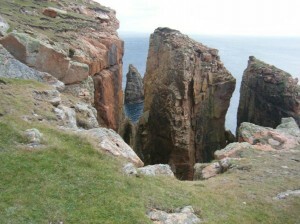 The Eshaness cliff walk is less than four miles long. It will, though, live long in your memory. The cliffs were formed from volcanic eruptions 400 million years ago. They provide a breathtaking walk with spectacular geological sites along the way; blow holes, sea stacks, caves, laver flows, and layers of volcanic ash. Your starting point is the lighthouse which is easy to find and can be seen for miles. 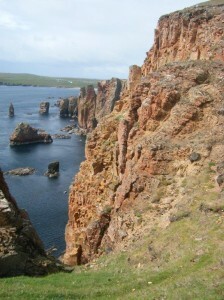 (Near here you will also find great sea cliff climbing of all grades). Walk north with the wild Atlantic below you, and you can witness the wonderous carved rocks which are monuments to the violent storms that have created them since time immemorial. At a safe distance from the edge, walk towards the head at Calder’s Geo, Then head north and you will see the spectacular Grind of Navar where two massive bastions of rock have been ground out like staircases from the relentless Atlantic storms. You then go round the headland to the bay of The Burrs, before coming to the Hole of Scrada, a cave part collapsed yet stretching over a hundred yards into the cliffs. Fulmars swoop and dive bringing the stacks alive.Gannets back them up diving from high like Exocets striking into the turbulent sea. Looking inland there are wonderful views to Ronas Hill, the most ancient of hills formed from Lewisian gneiss the oldest rock in Europe. You then continue south before reaching the Lighthouse, your original starting point. On a windy day with rough sees below you can feel the full force of nature all around you and imagine a time when volcanic eruptions formed this natural wonder. If you are after a long cliff walk, look elsewhere. Few walks, though, leave such a lasting impression. It’s exhilarating to experience and leaves a sense of wonder and excitement about how nature’s beauty and brute force have bequeathed amazing landscape for us all to enjoy..